There are 100 counties in the state of North Carolina. A marriage license can be obtained in any one of those counties, and that license can be used to get married anywhere in the state. However, be aware that each county office may differ in regard to required documents for application. You may check county websites to determine specific requirements. Both parties must personally appear at the Register of Deeds Office to apply for a wedding license. There is no waiting period for the license. The license may be used from the moment it is issued. However, marriage licenses are valid for only 60 days after they are issued. The application will be invalid if you apply after your ceremony has taken place. There must be two witnesses to the ceremony – whether it is civil or religious. 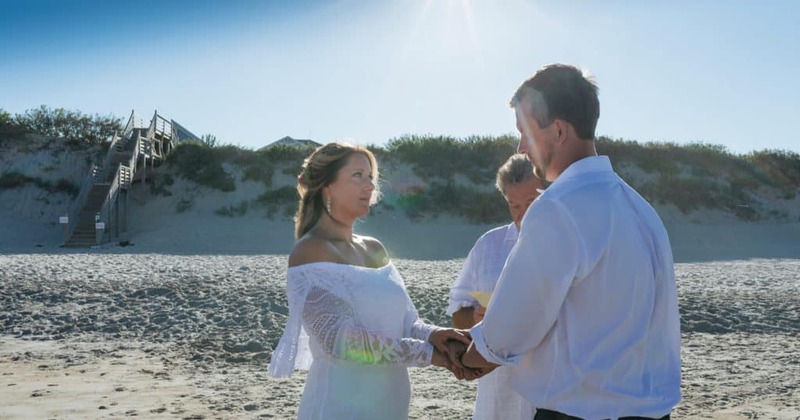 A dedicated page on Dare County’s website allows couples to complete and submit their marriage application before they visit the county office. Expect to spend about 30 minutes for the online process. Completing the application online will help speed things up when you arrive in person. A valid government picture ID that includes your dates of birth. Social security card or any other official paperwork with your social security number listed, such as a W2 form or pay stub. Divorce decree with judge’s signature if your divorce was less than a year ago. If your divorce was more than a year ago, you just need to be able to list the date of the divorce on your application. If either of you is under 21, certified birth certificate is required. Those under age 18 will need more affidavits and should consult the website or Register of Deeds office directly, prior to going. The Dare County Register of Deeds office is open weekdays from 8:30am – 5pm, but applicants should arrive no later than 4:30pm. Although Monday is their busiest day, other days between noon and 2pm are fairly busy as well. Payment methods: Cash, checks, money orders or credit cards (with a 2% surcharge). The Currituck County office is located on the mainland and is approximately 13 miles south of the Virginia state line. Although Currituck County has a satellite office in Corolla, it does not provide marriage license services. There are downloadable forms and worksheets on their website. Couples can complete the paperwork ahead of time and arrive prepared. A valid government picture ID that includes your date of birth. Social security numbers and the dates of previous marriages or divorces, but official documentation is not required of either. The Currituck County Register of Deeds Office issues marriage licenses from 8am – 4:30pm, Monday through Friday. Payment methods: Cash, money order, or personal check. The Hyde County office is located on the mainland and is approximately 68 miles west of the Outer Banks Welcome Center in Manteo. Hyde County also provides downloadable forms and worksheets on their website. Complete the paperwork ahead of time and arrive prepared. Social security card or any other official paperwork with your social security number listed, such as a W2 form or old pay stub. If previously married, you must provide the month and year of your last divorce(s). There is no waiting period. If under age 18, consult the website or Register of Deeds office directly, prior to going. The Hyde County Register of Deeds is open weekdays, 8am – 5pm. Marriage license applicants should arrive no later than 4pm. Payment methods: Cash only. Once your minister, magistrate, or officiant has announced you and your beloved officially married, it is their responsibility to sign your marriage license and return it to the issuing county office within 10 days after the marriage ceremony. It is important to note that marriage certificates are not automatically mailed out to newly married couples. You must request an official copy of your certificate after the wedding ceremony. To obtain a certified copy, download the request form from the appropriate county’s website and follow the mailing instructions. The charge for each copy is $10. 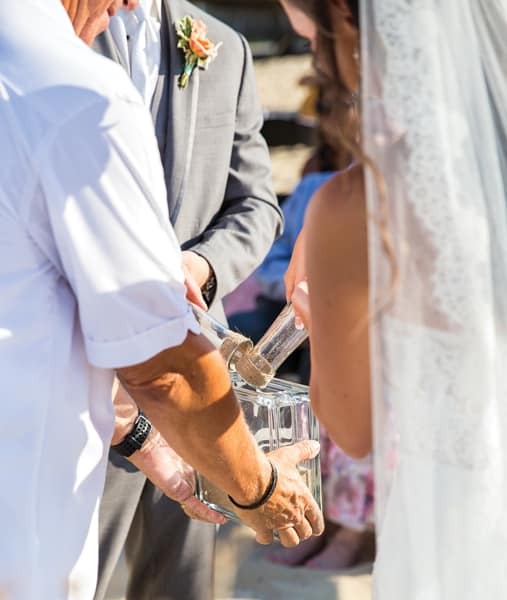 While you’re perusing the county websites, it is a good time to check on any additional permits or restrictions regarding your wedding festivities, especially if you are planning an on-the-beach ceremony. 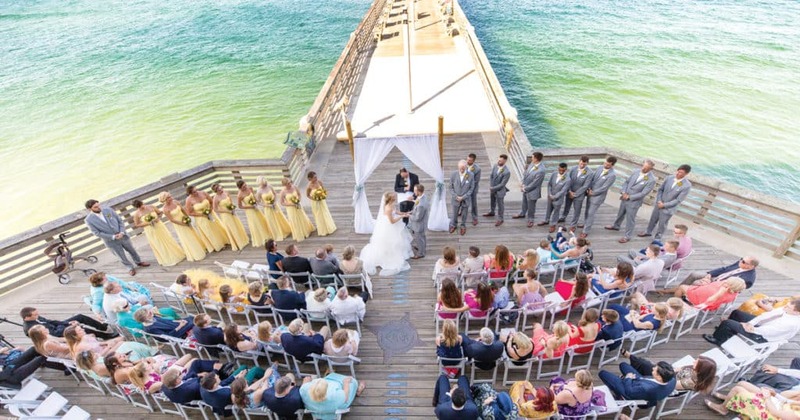 The national seashores, public beaches, and lighthouses each have different regulations regarding outdoor ceremonies. Scroll through their websites to see what they have to say about tents, chairs, arbors, etc. When planning your wedding, be sure to do your research when it comes to regulations and required permits within the municipality you plan to tie the knot. Here’s a listing to help you get started on other town-specific regulations. There are no public parking lots or public accesses for the beaches in Duck. The Town of Duck requires that any gathering of 50 or more people register with the town’s Department of Community Development at least 30 days before the event. Rehearsal dinners, brunches, and post-wedding parties also fall under this requirement. Registration forms are available on the town’s website. 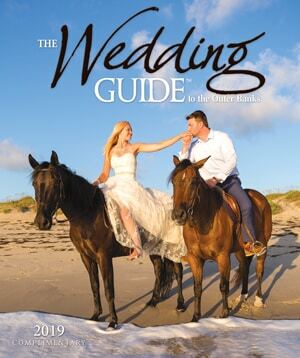 It is recommended that the bride and groom shuttle in guests from other locations as there is no public parking available in Southern Shores. Couples can apply for an encroachment parking agreement if they think they may have parking overflow at a rental home. An event permit is required to erect tents or canopies, but there is no fee. Also fires are not allowed on the beach. A $50 outdoor gathering permit is required for groups of 50 or more. If you are planning to set up a tent that is more than 200 square feet, there is an additional fee of $25 for fire inspection. You may set up chairs and decorations, but no tents or canopies are allowed on the beach. To erect a tent or canopy at your rental home, you must obtain a building permit, but there is no fee. The number of chairs allowed on the beach is 40. Tents and canopies are allowed only on private property, and if they exceed 400 square feet, they require an inspection. 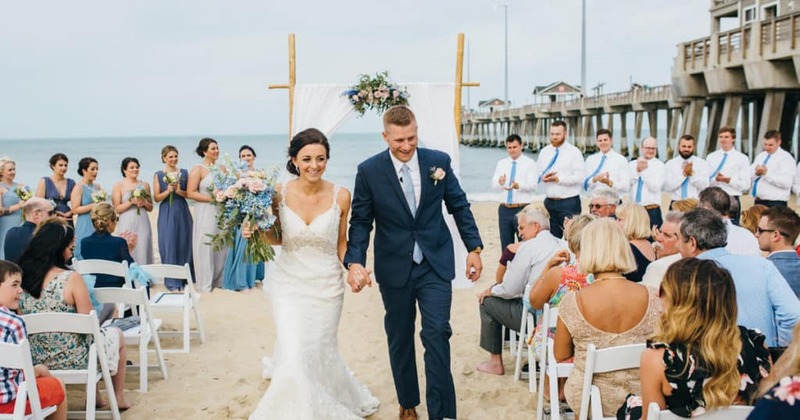 A downloadable wedding reservation form is on the town of Manteo’s website and is required to confirm the availability of a time slot for your waterfront wedding. Tents on private property that are more than 400 square feet require a permit and tents or canopies over 200 square feet may require an inspection by the fire marshal. 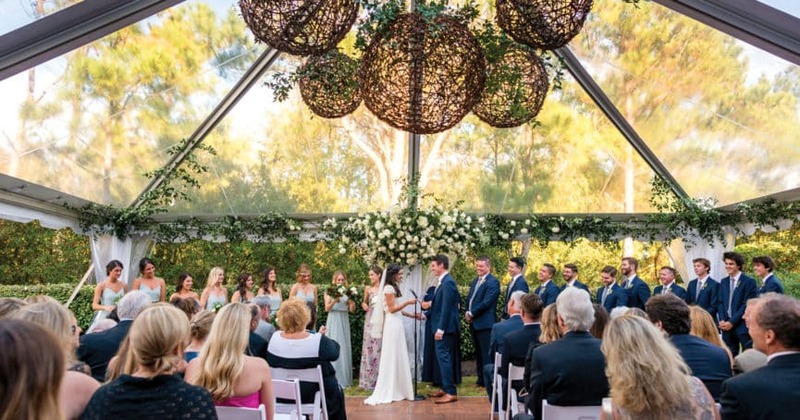 Weddings with more than 100 guests may need a mass gathering permit.